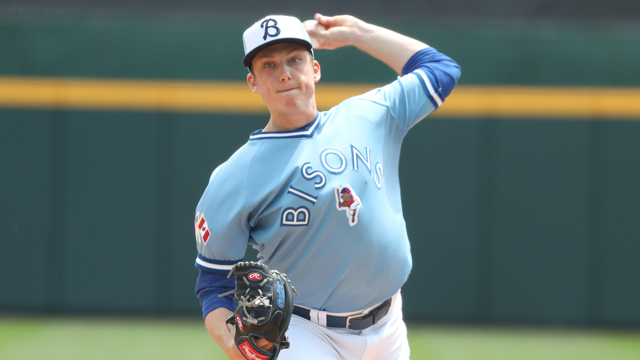 BUFFALO, N.Y. -- The Toronto Blue Jays today announced that they have recalled LHP RYAN BORUCKI from the Buffalo Bisons. Borucki, the Blue Jays #8 prospect by MLB.com, will make his Major League debut tonight as the Blue Jays are in Houston to take on the Astros (8:10 p.m.). After making his Triple-A debut at the end of last year, Borucki has spent the entire 2018 season thus far with the Bisons and is 6-5 with a 3.27 ERA in 13 starts. He leads the Herd in wins, innings pitched (77.0) and strikeouts (58), while also holding Triple-A batters to a .221 average against. Borucki is coming off a complete-game shutout in his last start, June 19 in Pawtucket (Game 1) that helped him earn International League Pitcher of the Week Honors. The Blue Jays 15th round pick in 2012 has worked into the sixth inning in each of his last nine starts. Since May 6, the southpaw has allowed more than three runs in a start only once and is 2-0 with a 2.81 ERA in his four starts in June. Borucki has a career minor league ERA of 3.32 in 77 starts (86 games).